East Ocean Teochew Restaurant at Shaw Centre has always been known as one of the top restaurants in Singapore serving Hong Kong style Teochew cuisine. It is the place that most people mention when you ask them what their favourite Teochew restaurant is. Besides serving traditional Teochew favourites, they are also very popular for their dim sum. For several months, friends have been telling me that I simply have to go there during weekend for dim sum. I finally made a trip there recently, and the nostalgic atmosphere really reminded me of Red Star Chinese restaurant. If you are still thinking of where to go for dim sum brunch this weekend, why not check out East Ocean? Weekends are meant for dim sum. On weekdays, East Ocean restaurant has an ala carte menu to order from. But come weekends, staff will bring out trays of dim sum to every table for customers to choose from. They have a good variety of dim sum, and prices range from $4.8 for a basket of siew mai, to $5.8 for the baked BBQ pork pie. The Po Luo Bun was very good. In fact, I’d go as far as to say that it is one of the best Po Luo Buns in Singapore. 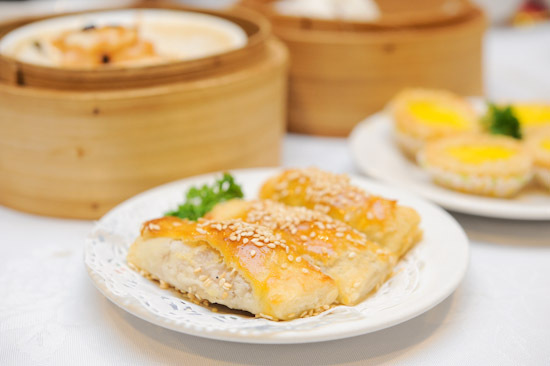 Like many dim sum restaurants, East Ocean has three different kinds of Cheong Fun – char siew, prawn, and scallop. We had the char siew one; it was decent but not something that I’d stop to notice. And of course, the famous Custard bun ($4.8) that everyone is talking about. East Ocean’s rendition was pretty good, but I don’t think that it is the best custard bun that I’ve had. The other dim sum that we had include: Mini Crispy Egg Tarts ($5.8), Scallop Tofu ($5.8), Pan-fried carrot cake ($4.8), Steamed BBQ Pork Bun ($3.5) and Deep-fried Crispy Prawn Dumping ($5.8). The dim sum at East Ocean Teochew Restaurant is not particularly outstanding. Moreover, prices are about the same as some of my favourite dim sum restaurants like Royal China, Paradise Pavilion and Yan Ting. Having said that, East Ocean has a nostalgic feel, and this probably explains why it is so popular. It is quite fun to order directly from the dim sum trays going around. But like Red Star restaurant, the queue is really long during weekends. I won’t go back just for the dim sum, but I think it is a nice place to bring your friends for the dim sum trolley experience. Whew, looking at the dimsum pictures makes my mouth water. I be sure to drop by at East Ocean Teochew Restaurant Singapore if ever I have the chance. Thanks for the details and timing information! Have you tried their dinner?